Viventa V3 bastante acolhedora a 1 minuto da Marina de Vilamoura. equipada. Zona de refeições com capacidade para 6-7 pessoas. sala de estar com dois sofás, lareira e tv po cabo. Os quartos estão equipados com ar condicionado. Acesso à internet ( wi-fi). Duas zonas exteriores com mesas e cadeiras ideais para relaxar e realizar refeições no barbecue. Marina Coral is the ideal accommodation for those seeking a quality space, with privacy, to enjoy restful vacation days. All of this in beautiful Vilamoura! Marina Coral, ideal for holidays with family or friends, features one twin room and two double rooms. It accommodates 6 guests. The common areas are spacious and arranged in a way that its guests feel truly at home. A living area with two couches, a coffee table, a fireplace and a TV. A dining area with a table and chairs. Finally, there are two common bathrooms and an equipped kitchen where you will find everything you might need to prepare your meals. Marina Coral is at center of the marina of Vilamoura. In front of the house you have a nice parque ideal for children to play. 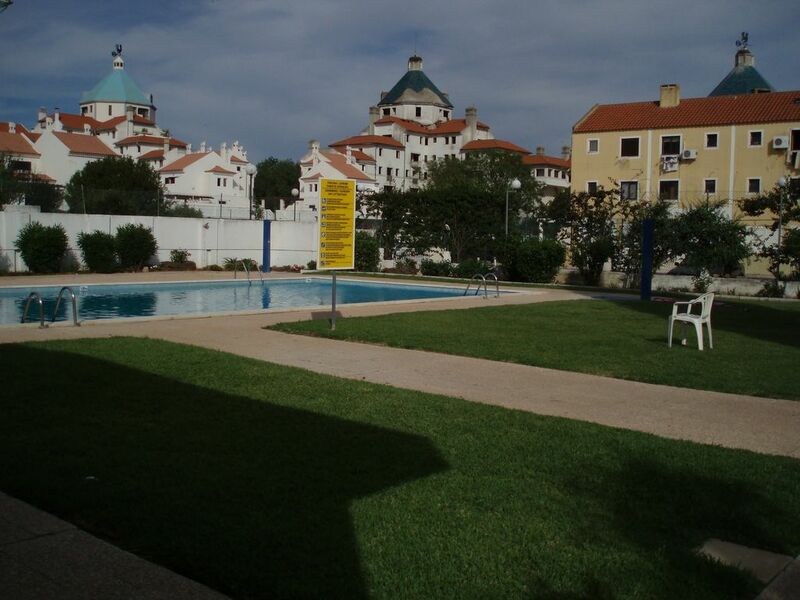 there is a pool 10 meters from the house, which is provided only to people who are in the houses of the neighborhood. The marina, bars and restaurants is a 2 minute walk from the house. The nearest beach is 5 minutes from the house. Aconselho vivamente a estadia nesta casa. Passamos lá 15 dias fantásticos. A propriedade tem todos os utensílios necessários a umas ótimas férias. Muito bem localizada, perto da Marina e das praias. Não é necessário sequer ter carro disponível. Ideal para umas férias em família. A moradia é fantástica, está totalmente equipada com o que é necessário para umas férias incríveis, tem espaços exteriores para conviver e relaxar em grupo, e a localização é sem duvida excelente. Um obrigado às proprietárias que foram muito simpáticas, prestáveis e flexíveis em tudo que foi solicitado. Muito obrigada pela sua opinião. Faremos sempre os possíveis para agradar e proporcionar aos nosso clientes a melhor estadia possível. Vivenda muito agradável, espaçosa e clean. Extremamente próxima da marina e de qualquer procura comercial. Muito obrigada pelo seu comentário. Foi um prazer recebe-los. Até uma próxima. CASA MUITO BEM SITUADA, MUITO AGRADÁVEL. The property was brilliant. Highly recommended. The property was very clean, tidy and in an excellent location. 2 mins walk away from the Marina, restaurants and bars. The owner was very helpful before our arrival. We arrived late at night and the lights had been left on making it homely and welcoming, along with the beautiful pastries. The shared pool was just at the back of the house and you could only enter with a gate card. There was 6 of us and we had plenty room you never felt the house was full as the living space is over 2 floors with a terrace on each and the bedrooms over a further 2 floors. The outside space at the house was great. The house was fully equipped with everything you would need. Would defiantly return again. Highly recommended. Thank you for the lovely words. Was a pleasure receive you. I hope sincerely you come back.